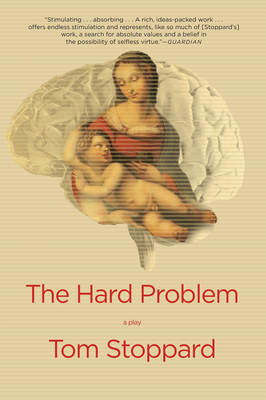 The Hard Problem: A Play (Paperback) | The Drama Book Shop, Inc. Above all don't use the word good as though it meant something in evolutionary science. The Hard Problem is a tour de force, exploring fundamental questions of how we experience the world, as well as telling the moving story of a young woman whose struggle for understanding her own life and the lives of others leads her to question the deeply held beliefs of those around her. Hilary, a young psychology researcher at the Krohl Institute for Brain Science, is nursing a private sorrow and a troubling question. She and other researchers at the institute are grappling with what science calls the "hard problem"--if there is nothing but matter, what is consciousness? What Hilary discovers puts her fundamentally at odds with her colleagues, who include her first mentor and one-time lover, Spike; her boss, Leo; and the billionaire founder of the institute, Jerry. Hilary needs a miracle, and she is prepared to pray for one. Tom Stoppard is the author of such seminal works as Rosencrantz & Guildenstern Are Dead, Jumpers, The Real Thing, Arcadia, The Invention of Love, and the trilogy The Coast of Utopia. His screen credits include Parade's End, Shakespeare in Love, Enigma, Empire of the Sun, and Anna Karenina.